Evelyn B Renfro, 77, a lifelong resident of Sierra County, passed away on February 7th, 2019 in her home surrounded by family. Evelyn was born on January 11th, 1942 in Monticello NM. She grew up in Cuchillo, NM and attended and graduated from Hot Springs High School in 1960. After graduation, Evelyn moved to Truth or Consequences and began working at the Dixie Café. Evelyn soon began a 42-year stint in civic service. She began in the City of Truth or Consequences office of the Clerk. She ended up becoming Clerk and after 34 years of employment, retired as city manager in 1999. She felt the need to continue her service in 2004 by becoming a city commissioner for 2 terms, finishing in 2012. She made many cherished friendships and acquaintances during her tenure. 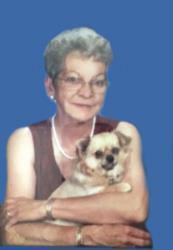 Evelyn was a lifelong devoted Catholic and attended Our lady of Perpetual Help frequently. Evelyn and her family were widely known for their very large and wonderful Christmas lights on West Charles St in TorC. Evelyn was preceded in death by her Parents Frank and Mary Bierner, her husband Bill Renfro, grandson Scott Wayne Williams Jr, her sisters Myrtle Cole and Ruella Gabaldon, and her lifelong friend, Kathleen Terrazas. Evelyn is survived by her daughters Ruthie Moffat of Edgewood, Shawnee (Scott) Williams of Arrey, Sonya (Bruce) Williams of Caballo, Serina (Jared) Bartoo of TorC. grandchildren Bonnie Robinson of Albq, Justin (Jennifer) Blacklock of TorC, Kyle (Roxanne) Blacklock of TorC, Darleen (Vincent) Apodaca of Elephant Butte, David (Brianna Covarrubias) Gurule of Las Cruces, Audrianna Renfro, Bruce and Marissa Williams, Jordan and Jaylyn Bartoo, Great Grandchildren Leonardo and Lyla Blacklock and Eli and Blayden Apodaca. Cremation has taken place and a Rosary will be recited on Tuesday, February 12, 2019, at 6:00 PM at Our Lady of Perpetual help Catholic Church with a Memorial Mass on Wednesday, February 13, 2019, at 10:00 AM at Our Lady of Perpetual Help Catholic Church celebrated by Rev. Don Hyatt, CSB. Mrs. Renfro's remains will be laid to rest next to her husband at Hot Springs Cemetery. We are so sorry for your loss and pray that happy memories help you find peace. she will be greatly missed. she was a great boss and coworker.